The weekly picket for justice at TYS Laundromat continues. Please join us in support. Every Thurs, 5pm – 6pm. 215 E 116th St, East Harlem, NY. -Learn about our Laundromat Campaign. Laundromat Workers have the Power! –June 24, 2018: Laundromat Report Launch; FB Event. While our clean clothes tumble at high heat, laundromat workers are being hung out to dry. As a fragmented and often isolated workforce, laundromat workers face unique vulnerabilities and challenges when it comes to organizing or advocating for their rights. 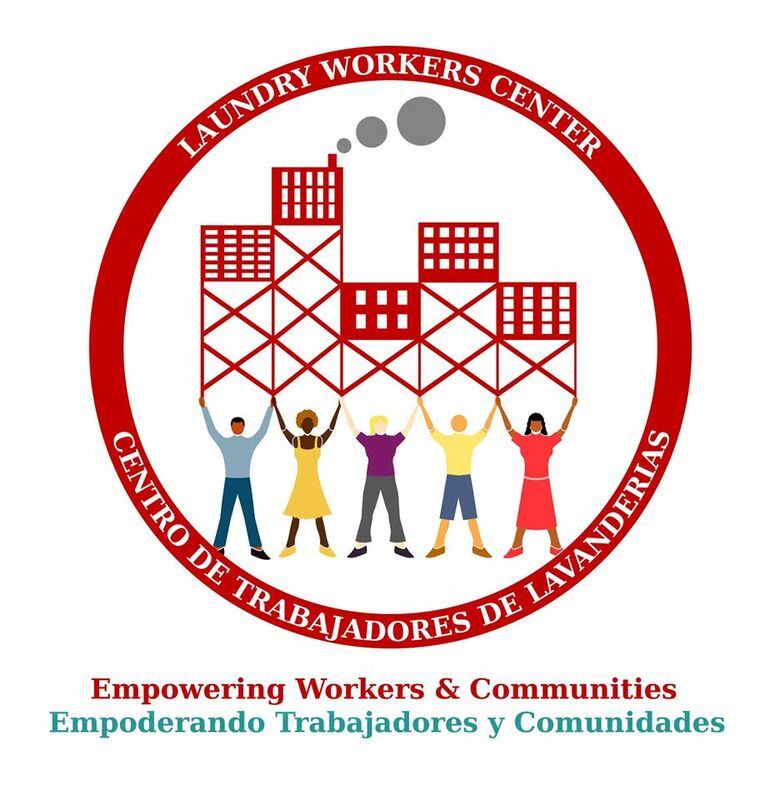 Based on 3 years of participatory research at hundreds of laundromats throughout New York City, Laundry Workers Center is publishing our first report on coin-operated laundromats. “Workplace Issues and Socio-Economic Conditions of Laundromat Workers in New York City” sheds light on the violations and hazards that laundromat workers face. With over two thousand licensed laundromats in New York City, the need for worker and community power is significant. -9:30am: Action for B&H Photo workers / 34th St. & 9th Ave.
Dear community: Please join us in supporting the B&H workers as they take a stand for their future. In a basic union-busting move, B&H is planning to close their 2 unionized Brooklyn warehouses and relocate in New Jersey. This move would essentially make it impossible for workers to keep their jobs. As a community, we must stand together against bad employer practices. Please join the B&H workers (and the big blowup rat!) to alert the public and let the company know NYC will not tolerate such injustice. Solidaridad! B&H: Don’t Abandon Working Families in NYC / Rally for good jobs! Don’t let B&H undercut gains made by workers if they move to New Jersey! –Fri, Dec 2, 2016: SAVE THE DATE! See FB for info. Beginning with Hot & Crusty, Laundry Workers Center members have inspired so many in New York and beyond. Immigrant workers fighting for justice in the workplace, backed up by union members, activists, community groups, and Occupy Wall Street. We stand together, we fight, and we win! On Friday, December 2, we are launching our new fundraising program, calling on the community to support our worker-led, militant organizing model–for the long haul. Come and celebrate our victories with worker-leaders from the Titlanice campaign, B&H Photo, Liberato, and our newest underground campaign. Talk about the future of LWC. And help build the workers’ movement in New York and beyond. Friday Dec. 2, 6pm-9pm / New York New Jersey Joint Board / 33 W. 14th St. New York, NY / More details to come! 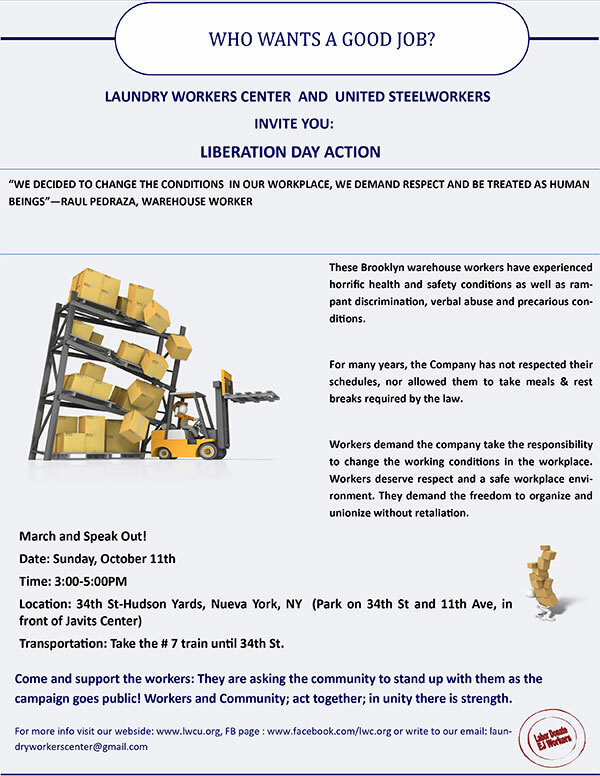 Send an email to laundryworkerscenter@gmail.com if you can help out. AUG 25, 2016: “Workers Rising; Good Salaries!” Bronx Workers’ Forum. FB Event. In 2016, workers are rising! From unions strikes, to ICE protests, to Black Lives Matter marches, working people are demanding change. Now! On August 25th, come together with workers and organizers across the city for a panel and discussion on how we are fighting for better pay, and why we deserve more! –April 23, 2016: Titlanice Campaign: Liberation Day. FB Event. Inspired by the Liberato Restaurant workers organizing, the workers named their new campaign “Titlanice”, which translates to “Vamos a ganar”. For years these workers faced wage theft & abusive working conditions. Now, after intensive training with LWC’s Leadership Institute, they are coming together with all of you to break their chains! ***URGENT: To All Defenders of Labor & Immigrant Rights:ALL OUT THURSDAY, JANUARY 28, 2016; 5pm!Stop Union-Busting and Job Destruction at Bröd Kitchen(formerly Hot & Crusty). FB (scroll down) . Para todos los defensores de los Derechos Laborales e Inmigrantes: Todos fuera este Jueves 28 de Enero a las 5:00pm. Apoyemos a los trabajadores de HOT & CRUSTY. CLICK FOR DETAILS. **Tues, Jan 12, 2016: Picket to End Retaliation!6:00pm; 571 Wythe ave, Brooklyn, New York, 11211. FB Event. 34th St-Hudson Yards (take the 7 train to the end of the line in Manhattan). ***CRUCIAL TO SUPPORT THE LIBERATO STRUGGLE. GO TO THEIR APPEAL. CLICK HERE. See Mon picket update below. Dear LWC and Liberato campaign supporters—At the request of the judge, Liberato workers have entered settlement talks with the restaurant to see if a fair agreement can be reached before trial. In addition, the judge is ordering an independent review of Mr. Liberato’s financial records–an important step for the campaign. 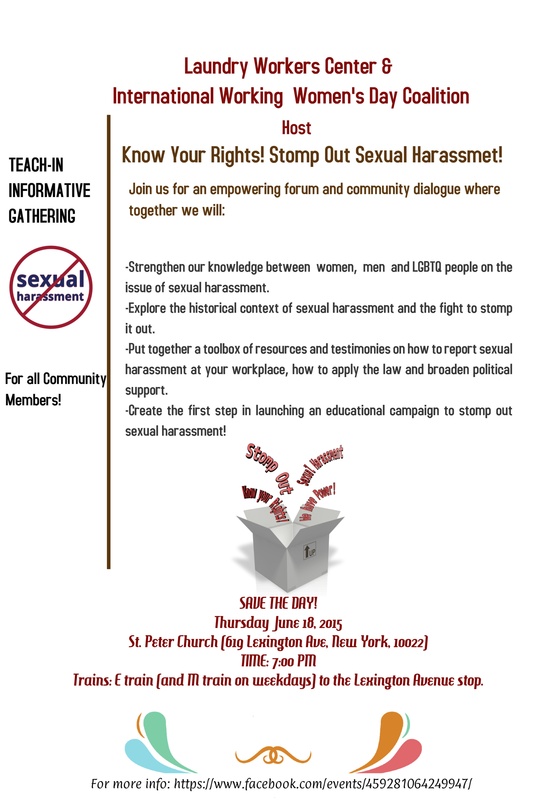 –Monday June 22, 2015 – 4pm; the Laundry Workers Center is hoping to have one of it’s biggest pickets yet at Liberato in support of workers fighting wage theft and sexual harassment. Action starts at 4pm at 183rd and Jerome, right under the 4 train. 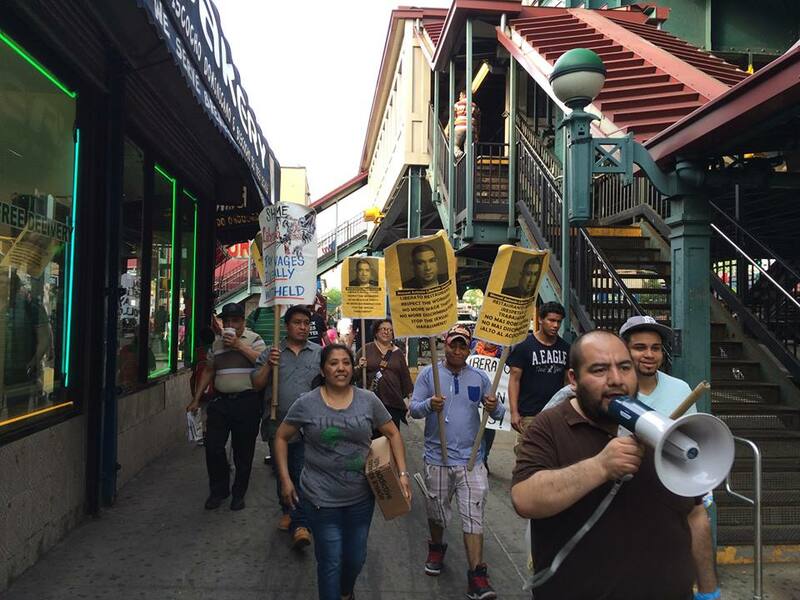 At 5pm the crowd will march down Jerome Ave to the Liberato Restaurant on Burnside Ave.
BYOC (Bring your own Chicken! Cuz Liberato’s tastes like wage theft). FB Event. 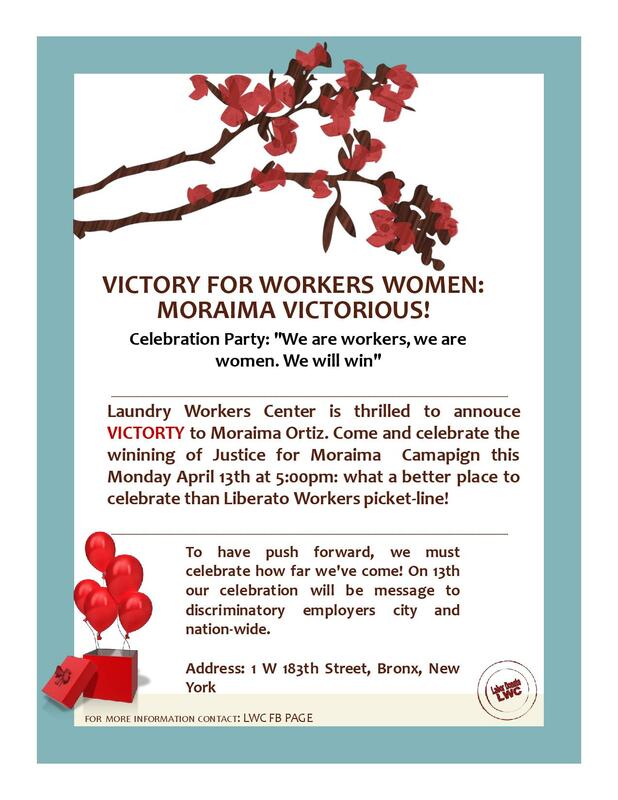 Laundry Workers Center is thrilled to announce VICTORY for Moraima Ortiz! Victory for women workers! 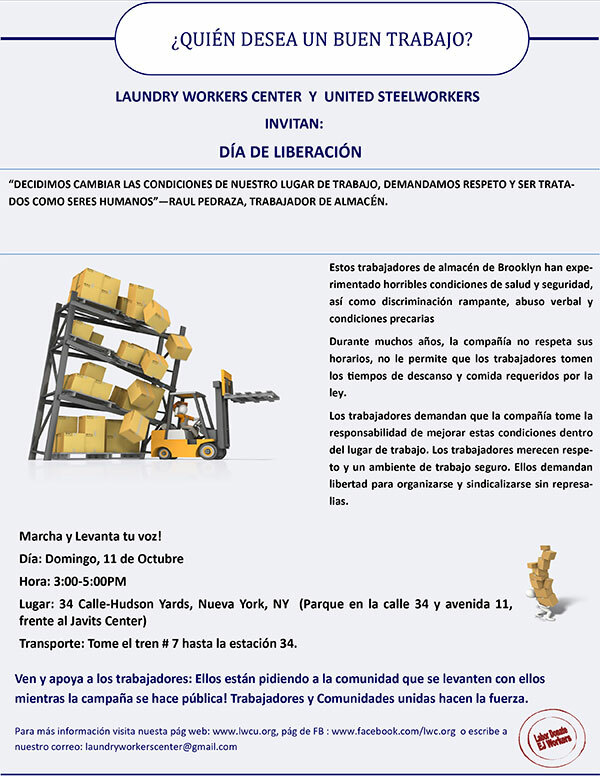 Please join Laundry Workers Center and celebrate the winning of the Moraima Ortiz Campaign on Monday, April 13, 2015 at 183rd St and Jerome Ave in the Bronx: what better place to celebrate worker/women justice than the Liberato picket line! Moraima did not need a settlement with her previous employer to know she had won. Her transformation into a community leader and advocate for immigrant and working women’s rights won her and the movement a victory long before the picketing stopped, and the settlement was signed. A victory for Moraima is a victory for all women workers! It is a victory for LWC, for all our allies, and for low-wage and immigrant communities everywhere. On April 15th, fast food workers will strike across the country to demand a living wage of $15/hour. On April 14th, black and brown voices will take to the streets to demand that black lives matter. 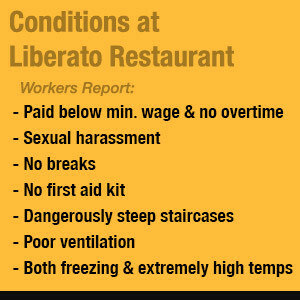 On April 13th, Liberato workers will picket outside their restaurant to demand a legal wage, an end to sexual harassment, and a safe workplace. To push forward, we must celebrate how far we’ve come! On April 13th, we will picket Liberato Restaurant, but also we will celebrate Moraima’s victory. Our picket party will be a message to unscrupulous, discriminatory employers city and nation-wide: We are Women. We are Workers. We will Win. Thank you all for your support, you are all a vital part of our victory. Please join us Monday to celebrate, to say victorious words among friends, and maybe eat some victorious cake.